Hoseini, M., Jonaidi Jafari, N., Mahmoodzadeh Poornaki, A., Sadraei, J., Rezavand, B., Hamedanchi, A., Abdi, J., Bagheri, O. (2013). Fever of Unknown Origin with Final Diagnosis of Imported Malaria: A Case Study. International Journal of Travel Medicine and Global Health, 1(1), 39-41. Mohammad Javad Hoseini; Nematollah Jonaidi Jafari; Abbas Mahmoodzadeh Poornaki; Javid Sadraei; Babak Rezavand; Aria Hamedanchi; Jahangir Abdi; Ozra Bagheri. "Fever of Unknown Origin with Final Diagnosis of Imported Malaria: A Case Study". 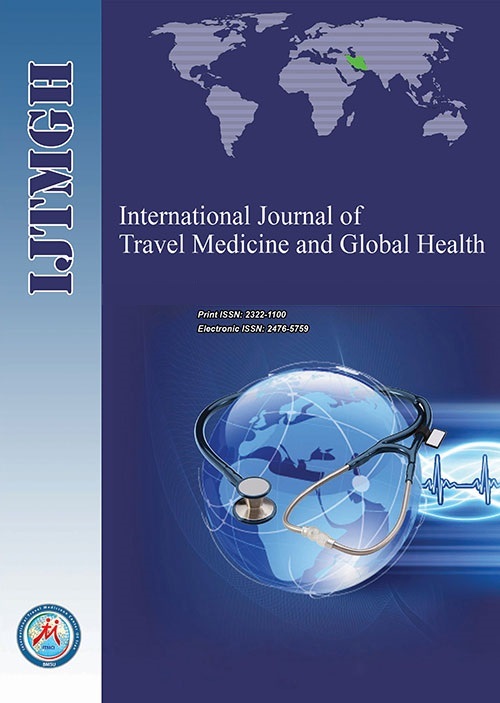 International Journal of Travel Medicine and Global Health, 1, 1, 2013, 39-41. Hoseini, M., Jonaidi Jafari, N., Mahmoodzadeh Poornaki, A., Sadraei, J., Rezavand, B., Hamedanchi, A., Abdi, J., Bagheri, O. (2013). 'Fever of Unknown Origin with Final Diagnosis of Imported Malaria: A Case Study', International Journal of Travel Medicine and Global Health, 1(1), pp. 39-41. Hoseini, M., Jonaidi Jafari, N., Mahmoodzadeh Poornaki, A., Sadraei, J., Rezavand, B., Hamedanchi, A., Abdi, J., Bagheri, O. Fever of Unknown Origin with Final Diagnosis of Imported Malaria: A Case Study. International Journal of Travel Medicine and Global Health, 2013; 1(1): 39-41. One of the most important infectious diseases in the world is Malaria. About half of the world populations are exposed to the risk of the disease. The program for controlling and eradication of Malaria has been being conducted in our country since many years ago. One of the public health problems in the endemic and non-endemic countries is Imported Malaria which can cause new and permanent infected foci. Population movement and travelling from endemic areas can transmit the disease to the clean areas and can also transmit the drug resistant Protozoa particularly Plasmodium Falciparum. Our case study describes a 30 year old person who has travelled to India for one month. He has visited a doctor in India because of fever, chills, malaise, and has received symptomatic treatment without any specific diagnosis .After returning to Iran, the symptoms appeared again after visiting by a doctor he has hospitalized with a diagnosis of Fever of unknown origin (FUO).He was checked for three days and on the fourth day, the blood smear of the patient showed Plasmodium Vivax. Ultimately he received the appropriate treatment and was discharged from the hospital in a good condition. Boutin J, Pradines B, Pages F, Legros F, Rogier C, Migliani R: Epidemiology of malaria]. La Revue du praticien 2005, 55(8):833. Wong CS, Behrens RH: Travel Health. Part 2: advising travellers visiting friends and relatives abroad. British journal of nursing 2008, 17(17):1099-1103. Rey S, Zuza I, Martínez-Mondéjar B, Rubio JM, Merino FJ: Imported malaria in an area in southern Madrid, 2005-2008. Malaria journal 2010, 9(1):290. Guedes S, Siikamäki H, Kantele A, Lyytikäinen O: Imported malaria in Finland 1995 to 2008: an overview of surveillance, travel trends, and antimalarial drug sales. Journal of travel medicine 2010, 17(6):400-404. Edrissian GH: Malaria in Iran: Past and present situation. Iranian Journal of Parasitology 2006, 1(1). Hassan V Fau - Arash R, Arash R Fau - Mehdi J, Mehdi J Fau - Ahmad R, Ahmad R Fau - Ali H-BA, Ali Hb Fau - Wali YA, Wali Ya Fau - Ali D, Ali D Fau - Abdulrasool M, Abdulrasool M Fau - Abbas P, Abbas P: Demonstration of malaria situation analysis, stratification and planning in Minab District, southern Iran. (1995-7645). Hanafi-Bojd A, Vatandoost H, Oshaghi M, Eshraghian M, Haghdoost A, Abedi F, Zamani G, Sedaghat M, Rashidian A, Madani A: Knowledge, attitudes and practices regarding malaria control in an endemic area of southern Iran. The Southeast Asian journal of tropical medicine and public health 2011, 42(3):491. Basseri H, Raeisi A, Holakouie K, Shanadeh K: Malaria prevention among afghan refugees in a malarious area, southeastern Iran. Bulletin de la Société de pathologie exotique 2010, 103(5):340-345. Nateghpour M, Khojasteh HA, Keshavarz H, Hajjaran H, Edrissian G, Rahimi A, Gobakhloo N: Comparison of microscopical examination and semi-nested multiplex polymerase chain reaction in diagnosis of Plasmodium falciparum and P. vivax. Eastern Mediterranean health journal= La revue de santé de la Méditerranée orientale= al-Majallah al-ṣiḥḥīyah li-sharq al-mutawassiṭ 2011, 17(1):51.